The city of Novi Sad (also known as Újvidék in Hungarian, and Neusatz in German) is located on the banks of the Danube River in the district of Backa (until 1918 the Hungarian county of Bacs-Bodrog), within the autonomous region of Vojvodina, in northern Serbia (formerly in Yugoslavia). The Jewish community of Novi Sad was allowed to build its first synagogue in the early 18th century. This first synagogue building was followed by three others that were erected one after another and served the local community during the 18th and the 19th centuries. With the numerical growth of the Jewish community in the last decades of the 19th century, as a result of the influx to the city of numerous Jews from smaller communities in Vojvodina, then under Austro-Hungarian rule, the building of the fourth synagogue, built in 1851 and renovated in 1859, became too small for the needs of the community. The increasing economic importance of the Jewish community, who in the early 20th century numbered more than 2,000 members, out of the general population of about 60,000, facilitated the establishment of a monumental synagogue. The building of the new synagogue, the fifth to be erected on the same location since the 18th century, became a major project for the entire Jewish community of Novi Sad under the leadership Dr. Karl Kohn, who served as its president for nine years (1895-1906). 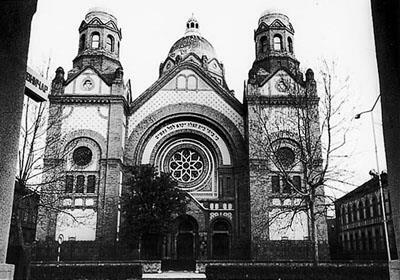 The Hungarian-born Jewish architect Lipot (Leopold) Baumhorn (1860-1932), at the time widely regarded as the leading synagogue architect in the Austro-Hungarian Empire, was hired by the Jewish community of Novi Sad and asked to plan a new synagogue. Baumhorn, who designed no less than twenty four synagogues during his career from 1888 to 1932, among them the impressive Neolog synagogue of Szeged (1903), in Hungary, devised a remarkable edifice. The building work of the Novi Sad synagogue started in 1905 and was finished in 1909. The new synagogue was part of a larger complex of buildings that included on both sides of the synagogue two edifices decorated in a similar pattern. One building sheltered the offices of the Jewish Community and the residences specially built for the synagogue officials, while the second building served the Jewish school. Located in Jevrejska (Jewish) Street, close to the city center, the synagogue has since its inauguration been recognized as a landmark of Novi Sad. 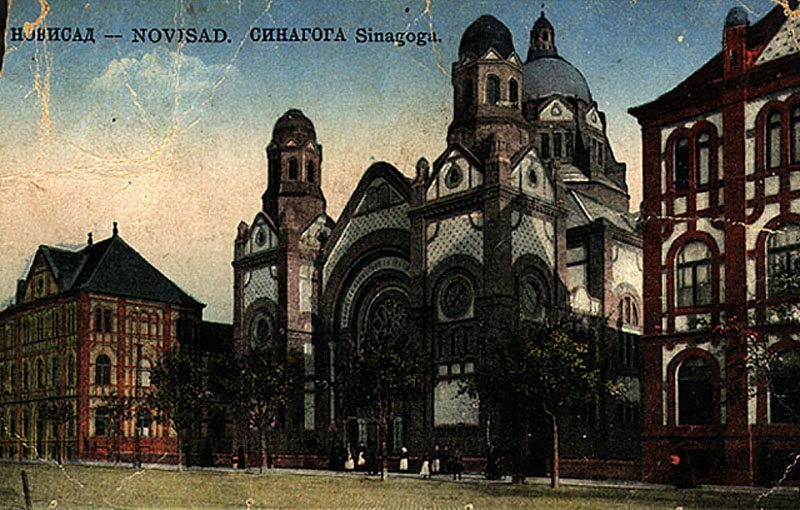 The design and size of the Novi Sad synagogue reflect the optimistic attitude prevailing among the local Jews who like many Jews in Hungary in the years before the First World War enthusiastically adopted Hungarian identity after emancipation (1867) and the official recognition of Judaism as an accepted and equal denomination (1895). At the time Novi Sad was part of Hungary and the local Jewish community belonged culturally to the Hungarian Jewry. Not only did the local Jews speak Hungarian, but when the great rift occurred within the Hungarian Jewry between the orthodox Jews and the Reform inclined Neolog Jews, the community of Novi Sad aligned itself to the more liberal camp of Neolog Judaism. This preference is reflected in the design of the synagogue and the rites followed by the community members. The synagogue of Novi Sad is a monumental building in the style of Hungarian secession. This typically Hungarian style combines Art Nouveau elements with ideas taken from the previously dominant Historicism style of architecture that was in fashion in the mid years of the 19th century. The design of the synagogue of Novi Sad strongly resembles the architecture of medieval churches: it follows a cruciform plan made up of a central nave with an apse on the east side crossed by a transept. The synagogue building is crowned by a large and high cupola that still dominates the other buildings in the neighbourhood. The cupola is supported by buttresses and rises over an octagonal basis that has a row of eight windows, each divided into three lights, serving as a lantern for the prayer hall below. The exterior walls of the synagogue, with the exception of the eastern one, are each dominated by a porch above which there is a rose window with stained glass. The western façade is flanked by two symmetric towers with smaller octagonal cupolas and boasts the largest porch. Smaller circular oculus windows decorate the towers of the western façade and the upper level of the apse. The eastern wall has, in addition to a prominent apse, two smaller apses that continue the lateral aisles of the nave. The western façade and the southern and northern walls are decorated with the two Tablets of Law with inscriptions in Hebrew. This is the only typically Jewish motif visible from the outside of the building. The interior of the synagogue is arranged in a manner common amongst liberal synagogues of the second half of the 19th century. The bimah is located close to the Holy Ark, at the eastern end of the prayer hall; there are rows of benches in the lower floor as well as in the two lateral balconies reserved for the women section. The prayers at the synagogue of Novi Sad were lead by a cantor accompanied by an organ, a mixed choir, and occasionally also soloists. Only about a quarter of the more than 4,000 Jews of Novi Sad survived the Holocaust that followed the German invasion of Yugoslavia in 1941 and the annexation of Novi Sad to Hungary. Over 800 Jews of Novi Sad – men, women and children of all ages – were murdered during massacres conducted by the Hungarian police against Jews and Serbs in January 1942. In May 1944 the synagogue of Novi Sad served as an arrest house for the Jews of Novi Sad and it was from there that they were deported to the Nazi extermination camps. The building of the synagogue, although desecrated and robbed of many valuable items, suffered only light damage. The synagogue was consecrated again in 1945 when it became the focal point of the revived Jewish life in the city. 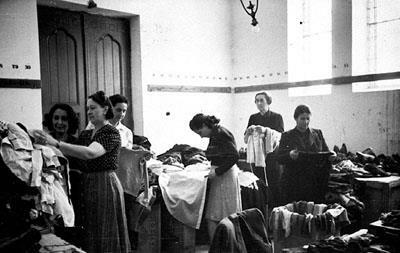 The American Joint Distribution Committee (JDC) used the premises of the synagogue during its aid activities on behalf of Holocaust survivors in the years after the Second World War. However, the Jewish population of Novi Sad dwindled further as many members of the local community chose to immigrate to Israel and other countries in the 1950’s. During the 1970’s the small number of Jewish worshipers left in Novi Sad used to pray in the offices of Jewish community, and used the synagogue only for the High Holidays. As the community no longer could support the costs of maintenance, in 1991 the synagogue building was leased to the city for a period of twenty five years. Taking advantage of the fine acoustics of the synagogue building, the city , having restored the interior, decided to use it as a concert hall for classic and other music performances. The Jewish community, nevertheless, is able use the synagogue whenever it wishes as they do each year for celebrating major Jewish holidays. The adjacent building that formerly housed the Jewish school is now home to a ballet secondary school. There were an estimated 400 Jews in Novi Sad in the early years of the 21st century. TISMA, Aleksandar. The Book of Blam. English translation by Michael Henry Heim. Pp. 226 New York: Harcourt Brace & Company.